Terrastock West (henceforth T2) was the second music festival sponsored by the British music magazine Ptolemaic Terrascope. I was fortunate enough to attend. This is my story. For those not familiar with it, the Ptolemaic Terrascope is a long-running music magazine co-founded by Nick Saloman (of Bevis Frond fame) and Phil McMullen in 1989. A pretty wide range of music is covered, bound together loosely by all having some kind of psychedelic sound or intent. It's a beautiful read. When financial crisis threatened the future of the Ptolemaic Terrascope (henceforth PT), a benefit concert was suggested as a means of helping out. Many bands offered their services, and Terrastock I took shape. It was held in a Victorian factory building in Providence Rhode Island in April of 1987. The outcome amazed even the organizers, and the "Terrastock spirit" was born! I had enviously been reading the reviews, and cursing my luck to be earthbound on the opposite coast, but as we all know "space does not care"! One day, whilst wistfully looking over photographs of Terrastock I on the PT website, a small notice about getting on the mailing list caught my eye. I immediately signed up, not yet having an inkling that another Terrastock might be in the works. Blow me down if I didn't get an invitation in early January to buy an advance ticket for T2, and better yet, just 900 miles from my home! $60 for 36 bands over three days? Sure! Just who are "the 800 Club?" Ticket sales were limited to 800, with an emphatic "no free entry for journalists and other hangers-on". So far, so good. Not actually physically knowing anyone who would be attending, I began to wonder just who I would meet there. I had corresponded with several psychonauts via e-mail and newsgroups on the internet, so I knew there was good company to be had. Publicity? There was next to nil. Word was spread by word of mouth, an internet mailing list, maybe a small-ish hand lettered sign at Aquarius Records in San Francisco. By the time the larger world became aware of the impending fest, all the tickets were sold. Again, perfect. Usually, when you buy a ticket to an event you get the following information: performer name, time to show up, seat number (if any)...and...that's about it. Not this time. A full-featured web site (with a mailed paper-copy for the computer-impaired) listed the address and phone number for all the cheap and moderately priced lodging by proximity to the venue, the bars and clubs, record stores, landmarks, "hippie sh*t", maps, transit schedules, you name it. I had the oddest feeling disembarking at SFO, I knew exactly where to go and how to get there! All credit to Carrie Hourihan for setting this up! The full schedule was available online, with links to bio-pages for all the listed bands, with mail order opportunities. Many of the listed performers were not familiar to me, but I felt I knew a lot about them by festival time! What a great resource. About three days before the festival, an ominous e-mail arrived: the festival venue was being moved. Argh! I had booked my hotel a mere 5 or 6 blocks away from the original site, a Victorian ballroom within shouting distance of city hall. The new spot was listed as the Custer Stages, at the southern extremity of town on a decaying shipping basin. I panicked a little, visions of every "botched festival" story I had ever heard ran through my brain! I needn't have worried - not only was the new venue VASTLY better, but free shuttle buses were being provided to the new site. Again, the difference! I arrive at my hotel - clean if somewhat fortress-like, in a neighborhood favored by the "thirsty souls" of San Francisco. The Guitar Center is across the street, complete with windows painted with the likenesses of Kiss! I hike to the shuttle rendezvous, in plenty of time for the first run (they are to run all day at ½ hour intervals). Time to meet my "terra-pals". About 6 or 7 guys are hanging out in front of the "Days (Daze) Inn" motel where many performers are staying. In this small group we have a guy from DC, three from Chicago, one from Bullhead City AZ (! ), one from Italy (!!) and two from Germany (!!!). About a third of the festival goers were from the SF area, the rest were from all over as this sampling illustrates. The Custer Stages is what looks like an old transhipping warehouse on the India Basin. I imagine clipper ships once unloaded silk and opium here, but then I'm an imaginative sort! It has been transformed into what looks like sound stages for film work, replete with coved corners, flat black surfaces everywhere, and in the main stage area drive-in movie sized screens. There is a smaller second stage, and a merchandise area. There are dirt and gravel areas out back along the basin for hanging out. It's a pretty isolated spot, I never saw anyone but concert goers here - perfect. The good news is: 36 bands in three days. The bad news is: 36 bands in three days! Nothing at all bad about that of course, but it's going to be grueling. As I'm walking into the venue, a familiar and much-loved song pulls me towards the second stage. It's "Splash 1" originally by the 13th Floor Elevators. Now I'm home, indeed. Brother JT is doing his solo thing, just him, an electric guitar, and sometimes a backup singer. His reputation for psychedelic zaniness is well deserved. One of his numbers includes the consumption of a moon pie as a surrogate Eucharist! 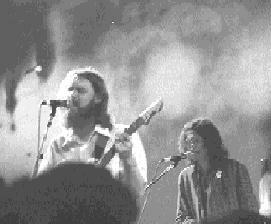 50 Foot Hose, an original SF psychedelic band from the mid 60's, now beckons from the main stage. They sound excellent, not unlike early Melting Euphoria. They feature many created instruments of indescribable form in their set, constructed from springs, and lamp parts, and who knows what else run through oscillators and the like. The light show knocks me backwards! I have never seen anything quite like it in 25 years of concerts! At one point, real time oscilloscope images of all the instrument tracks are being superimposed on top of fractal images on top of Sanskrit texts on a giant screen and all over the performers! It is being mixed on the fly by two or three ARTISTS on a scaffolding to the rear of the hall. A barrage of video projectors suspended from the ceiling deliver the most extraordinary images you have never seen. The Azusa Plane performed an instrumental onslaught of cosmic proportions with two guitars and drums. The fact that the drums were played with mallets suggests an (unfair) comparison with Ummagumma-era Floyd. This is deceptive as there is nothing retro about this go-ahead outfit. The discovery of the festival was, for me, Grimble Grumble (as in "a gnome named...") from Chicago. A four-piece (2 guitars, bass and drums) who play cosmic instrumentals that very much suggest a kind of 90's Interstellar Overdrive. Every one of the musicians are outstanding and notable; the guitarists coax uncanny sounds from their instruments, the bass sharp and precise yet lulling, and the drummer put on what can only be described as "an athletic performance"! Highly recommended, and readers in the Chicago area are urged to seek out live performance! About a thousand people watched Kendra Smith yet made no sound. You could have heard a pin drop, and it is an image I will never forget. At first the silence was out of respect, almost reverence. Later it was due to a complete hypnotic trance. This reclusive musician has appeared in public very seldom since her days in Opal and Dream Syndicate. Neatly divided into thirds, her set featured her (solo) on pump organ, bohemian tar (a gourd-bodied lute), and acoustic guitar. At one point an audience member called out a request for "Magick Power" (an Opal song) to which she replied "No, I'm already using that". I have no doubts whatever. Later that evening Mick Farren and the Deviants took the smaller stage by storm. Staggering drunk, Mick performed his nihilistic poetry, excellent I might add, to a rocking Notting Hill style backing. I have seen them described as "like Jim Morrison fronting the Stooges" I can only hope I age as well as he. Bevis Frond was , well, Bevis Frond! I was approaching overload at this point, what with the travel and all, and I fear I cannot do their set justice. The last great guitar band, without a doubt! Nick Saloman plays seemingly without effort, and his songs are first rate. I'd been hearing a lot about, but not yet heard Windy and Carl. Wow! This duo makes more of an impact than some 10-piece bands. They conjure musical atmospheres or environments ("ambient" doesn't work for me) with treated guitar and bass. Windy creates whole worlds with her baselines, or sometimes crouching sorceress-like behind her electronics, while Carl populates them with fractal life forms from his guitar. Eventually these worlds implode. They consider it a compliment when the audience falls asleep, and have often said so! The Young Fresh Fellows played a spirited set of frat rock, but after being hypnotized by the previous artists, it was an awkward segue - not the last of the weekend. Damon and Naomi are two thirds of the influential late-80's band Galaxie 500. I had heard a cut or two on the local college station, but was not very familiar with their work. I was most impressed! Live, they exude placidity. He: guitar She: bass. They alternate vocals, soaring vocals. At one point during their set I was reminded of a description I had read in the Rg Veda of the singing bards in an ecstatic state! They were joined on stage by several guests including Batoh and Kurihara and Tom Rapp. Masaki Batoh and Kurihara are alumni of the Japanese psychedelic bands Ghost and White Heaven. An incredibly talented pair, the guitar occasionally sounding more like David Gilmore c. 1972 than the real thing! The light show was especially effective for their set. I would strongly recommend readers investigate the domestic releases of Ghost, which I have seen at budget prices. Tom Rapp is a veteran of the 60's psychedelic folk outfit Pearls Before Swine, and much loved by PT regulars and many of the bands of this festival. Not being familiar with his earlier work, I have no reference point here. I can tell you he was the absolute heart and soul of the festival however, his gentle and relaxed bonhomie defining the general mood. He was joined on stage by his son, ex-wife, Paul Simmons of the Alchemysts, one of the Stone Breath fellows, Phil McMullen (the festival organizer and all-around nice guy) and Masaki Batoh (who both clinked wine glasses in absence of finger cymbals!) and...am I forgetting anyone? Gentle folk-psyche. 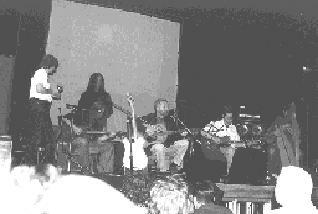 Stone Breath played a mystically-inclined Celtic folk psyche. Harp, crum horn, shawm - how nice to have some variety of instrumentation! Quite likable. It is at this point that the earths axis begins to re-align itself to Athens, Ga! The Elephant 6 crew is in town, and the world will never be the same! The Elephant 6 Recording Co. is actually a very loose collective of multi-instrumentalist madness and creativity. Members of one of it's stable of bands often play on each others recordings, and at shows. It's a regular game of musical chairs on stage with drummers jumping up to the theremin, while guitarists run back to the drums, and horn players appear and disappear! Neutral Milk Hotel was the first E6 band up. Bringing to mind Syd Barrett in a very loose kind of way, only much more high energy, they blasted! Jeff Mangum, whose creation this band is, likes writing songs about floating worms and two-headed boys. Julian Coster, who was to appear several more times, ran around stage switching instruments while wearing a motorcycle helmet with a complete set of chimes extruding from the top of it - all very cute but HE CAN PLAY!! A great live act! Olivia Tremor Control was up next, much anticipated! The stage was absolutely cluttered with gadgets and instruments, resembling a musical curiosity shop. A very appropriate image. For those not familiar with this outfit, they have an absolutely uncanny grasp of pop and psychedelia, sounding often like outtakes from "the White Album" or "Good Vibrations" era Beach boys (every reviewer says this) but never sounding either retro or imitative! The harmonies, the intelligence, the theremins! There was so much coming and going of guest musicians from the E6 empire, and so much switching of instruments that I cannot hope to give you any account of movements. Plain and simple, these people are geniuses, and from an incredible pool of talent, unmatched anywhere. To me, they represent one of the finest bands in the world, of all time. Really. Stretching out in the comfort of playing to the converted, they did less pop and more experimentation for this appearance than you may see at a normal gig. A long extended freakout, a natural bookend to "Revolution #9" or something, brought the show to a crescendo. One wag leaned into my ear and said "they musta figured this was a good chance to get high!" The thing is, they do it so much better than anyone else, it never loses its beauty or musicality. Joe Ross, of the Green Pajamas - himself a master of pop-psyche, said "man, that's the closest to "I am the Walrus" you are ever going to see!" I cannot recommend these ARTISTS highly enough! Unfortunately, the festival had to finish early on Saturday, a consequence of the abrupt change of venue. A conflicting commitment (read "rave") had prior claim to the Custer Stages after eight o clock. I later learned there was a big psychedelic freakout that night in town, with noisemasters PELT (about whom more later) but I decided not to tamper with the perfection of the day and retired early. I was glad the next morning. As a wonderful added bonus, another Elephant 6 band, Elf Power, was added to the bottom of Sundays bill. To an awakening crowd of 4 or 5 hundred, Elf Power really showed themselves in the best possible light. A fine performance that launched the final day of the festival in a fitting and memorable way! Currently enjoying success on the college charts, Elf Power has a gestalt about them that requires some explanation. Without ever sounding twee, they concern themselves with subjects such as kingdoms of elves and collecting an intergalactic zoo. There is a strong sense of conviction and group knowledge here that is reminiscent of the 13th Floor Elevators, not musically, but in a sense of shared motivating ideas. Again the multi-instrumental fun as errant E6 musicians whisk on and off the stage, adding thickeners to the sound! Laura Carter, Elf Power's keyboardist, added remarkable richness to their sound with her Zanzithophone (Casio electronic saxophone) that appeared to have undergone some treatment. Once again, spot-on live harmonies and driving rhythms demonstrated that something is being put into the water in Athens, Ga! The U.S. capitol, nay the UN should be moved there at once! Highly recommended! The Loud Family performed clever pop, with driving keyboards. I was famished and HAD to get lunch, so I can't fairly review them. That, and the sun was shining. The first blue skies I had seen since October. Readers from northern climes will understand! Alva are rather a rare bird. Three women, classically trained, performing whimsical avant garde compositions, with a ratio of tongue in cheek. Keyboards, violin, flute, saxophone: these are not twee or vapidly pretty "songs" but challenging, accomplished compositions. Fans of twentieth-century classical take note. Loren Mazzacane Connors was an unknown quantity to me. Playing incredibly slowly in near complete darkness, he did indeed "stop time" as festival compere Jim O"Rourke said. A unique experience. From my hometown, the Green Pajamas demonstrated their mastery of the psychedelic pop-song. Spot-on performance and an excellent arena-sized sound system provided an all-too-rare demonstration of what this largely-unsung outfit is capable of. In an equitable world, these guys would be superstars! Strongly recommended. Occasionally, if one didn't move quickly enough between showrooms, one got left out. I didn't move quickly enough and couldn't squeeze in the smaller stage two area for the Spaceheads. They do amazing things with treated horns. More I cannot say. While taking the air outside, a local band suddenly appeared in a large gondola (no, I wasn't hallucinating!) on the waterway playing "Minnie the Moocher"! I kid you not! The Silver Apples, sixties electronic pioneers, demonstrated just how much you can really do with oscillators and generators. A joy to see living legends, and vintage gear! Quite a discovery for me were the Alchemysts, from Somerset, England. How is it I have not heard of them? A growling "never never land" era Pink Fairies guitar tone, and a tight driving rock groove propel this power trio. Fans of Deviants/Open Mind late sixties proto-grunge take note! I began to notice a general movement towards the free ear-plug display by many, many people. When the group moves to that extent, take note! I got some too. Good thing, too. Pelt. Describing this will take effort. Practitioners of the "free noise" school. No songs - a drone that lasted an eternity with one instrument, one voice occasionally climbing on top, only to submerge again into the morass. Louder than anything I have ever heard in my life. A group of silhouetted musicians, backlit, sitting cross-legged in the style of Indian raga-master. A bowed guitar. A bowed tanbur. Some electronics. Human voices raised in sustaining single notes, with a hysterical edge to them - never quite a scream. The effect was very like the gathering of a large religious community to meet the end of the world, or to commit mass suicide. The volume was frightening, even with hearing protection. A profound and disturbing experience. Of particular interest to readers of this publication, SubArachnoid Space were the practitioners of the purest form of SpaceRock heard at the festival. 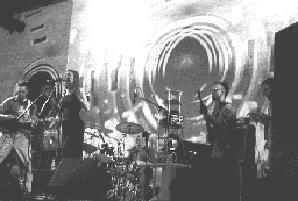 Powerful, very suggestive of Doremi-era Hawkwind, they performed shape-shifting numbers of inspired cosmic jamming. A high degree of musicianship too. If there is any justice they will achieve great success. Look for them. Cul De Sac performed their turbulent instro-rock, often resembling surf music from Jupiter. Energy plus, and talk about accomplished musicians. Buy their music, by all means, but above all see them live!!! Another joyous discovery, The Lothars. "Three theremins, one guitar - all heart!" That sums it up, all right. The most imaginative and creative act of the weekend without a doubt. They have adapted the theremin for use as main instruments in a rock ensemble as opposed to a mere effects box, or ornament. There is something very cool about performance on this instrument, especially Jon Bernhardts "bass theremin" technique. Arms pumping, hands palming the antennae, they often looked like robots, and I thought of "The Day the Earth Stood Still" for some reason. The whole thing is kept from loosing the bonds of gravity by Ramona's guitar, which functions in the regulating and anchoring role usually taken by the drums. A real achievement of ingenuity! Ah, Bardo Pond, the band that destroyed Philly! Fans of Yeti-era Amon Düül II will LOVE this band. Twin guitars driven through more effects boxes than should be possible , rock-steady rhythm section, and the wistful cosmic vocals of Isobel Sollenberger. Couple this with an absolutely cosmic lightshow, and you've got a mindblower! My one criticism: self-defeating excessive volume. By all accounts, they are known for this. They are now (June) on an extensive national tour, don't miss them. But take some hearing protection. At this point I was approaching absolute collapse, and subsequent observations will have lost objectivity and insight. Suffice it to say that Clockbrains deserve exploration, again very fine musicianship, and some pretty accomplished songwriting. I'm really sorry I can't say more. Another band from my hometown, this one a bit more notorious: Mudhoney! Architects of grunge, it was good and nostalgic to see them again, but also very incongruous! Brother JT and Vibrolux were, really, the best possible way to end the festival. Riotous psychedelic mayhem! Unfortunately, I had to leave to catch an early flight, so missed the valedictory! All in all, the best performance experience of my life. But more than that, wonderful fellowship and community and a glimpse of what can be done when people work together for the love of something, and without self-interest. My heartfelt thanks to all who worked so long and hard to make this festival what it was. I will never forget it, or any of the great people I met. Thank you.